November is here and I love the beautiful Fall colors and especially Thanksgiving! I have so much to thank the Lord for!! This month, we celebrate two birthdays: Gabe, on the 12th - he will be a Teenager - 13!!! and Paxton, on the 22nd - she will be 11!! What a blessing they both are! I will write about each of them separately, but I do want to post a picture of them all. This is my fam and I am very proud of each of them! It's been over a year since I posted here - I think it's time I "return" to blogging!! I thought this was "lost", but my daughter-in-love "found" it again for me! So now I will do my best to keep up once more...hopefully I will do better this time around - I have new pictures to add and much more to say, so will be back very very soon! Thanks for stopping by! 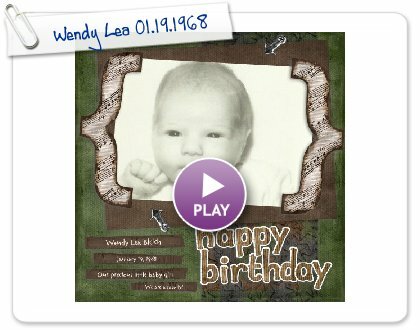 Today is our Granddaughter's birthday! 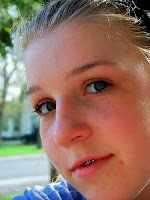 It was 15 years ago that we welcomed Abigail Lea into our arms and hearts! She is a wonderful blessing to us and we thank the Lord for her beautiful spirit and loving heart. She brings us so much joy, laughter, and happiness! Her life is a testimony to the Lord in everything she does. Happy Birthday Sweet Abby Lea! You are loved very much! Actually, this whole week is a celebration of birthdays in our family! On Monday, July 6th, we celebrated our son, Eric's, 36th birthday! 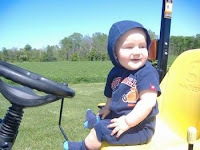 It is a very special blessing to have a son, especially if you are a Dairy Farmer, as my husband is. We had a lovely daughter and our family was complete when the Lord gave us a son! Now he farms alongside his Dad. The farm runs smoothly because of their teamwork and love for God's creations. But that's not all!!! Just one year ago on Saturday, the Lord blessed Eric and his wife Rachel, with a beautiful son!! Wheaton Randall Bleich entered this world on July 11, 2008 and he has brought a smile to our lives ever since!! He is a bundle of energy and joy that we totally enjoy! Every day is a new adventure to Wheaton and we are privilaged to share in his findings. I have the mind of Christ! I can't believe that April is almost over already! So I must "blog" today! I have been considering my "self-worth" - which is: 'the authentic self-esteem rooted in my uniqueness as a child of God'. In 2 Corinthians 4:16, it says: "...I am not to lose heart. Even though I am wasting away outwardly, inside, I am being renewed day by day!" What is my life goal? I must remind myself of what is lovely, true, gracious and worthy of praise....about ME!!! So I need to keep my focus ahead of me, rather than behind me! My peak moments are actually my potential showing! There is a song we used to sing: "Make me a blessing, make me a blessing, out of my life, may Jesus shine...make me a blessing to someone today!" That's what I want for my life!! To be a blessing to others, my God, my husband, my family and my friends. I want to serve the people that God sends into my life on a daily basis, and I want to share Jesus with everyone I meet!! As we close another month of the year 2009, I hope I have blessed YOU today! Remember that God created you special and He loves YOU so very much! Turn your life over to Him and watch Him do wonderful things through your life. Be a blessing in "your world" and be blessed!!! Focusing on What Produces JOY!!! 4:8 Questions = 4:8 Thinking = JOY-Filled Life!!! Now I need to put this into practice in my everyday life! Remember the saying: "Today is the 1st day of the rest of your life"?! 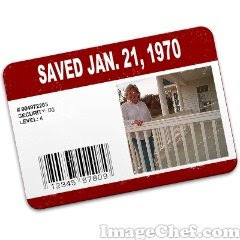 Well, 39 years ago, it really was the "1st day of the rest of my life!! Because of the love of a friend, Linda Brown, I met the Best Friend anyone could ever have - Jesus Christ - and He has made my life complete, my family complete, and my whole world right! I have never, ever, regretted my decision to give Jesus my heart and complete control of my life - every day He shows me how much He really loves me...and the wonderful things He plans for me are better than I could ever dream! I know that He only wants the very best for me and my life is abundantly fulfilling because of His Life in me. This is my goal for 2009!!! I am reading "The 4:8 Principle" in my devotions - a very good book by Tommy Newberry. He says that "no area of my life is untouched by my thoughts"....thus I need to choose to become "intentional" in my thinking and strive to "think like God thinks" in order to live a more joy-filled life - as God intended!!! So....I am going to take this slow and work on my thinking! First, I am going to "create a fresh start" - and that's what I'm doing here!!! That's why the background is so plain!!!! I tried to change the theme and lost everything!! My blogging knowledge is at kindergarten level right now!! I need help from my Granddaughter Abby!! 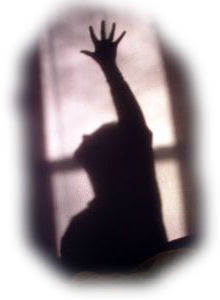 This week I am determining to "celebrate God all day, every day - revel in Him!" I am going to try not to "fret or worry" but instead - pray!!!! "Let petitions and praises shape my worries into prayers....letting God know my concerns"! That isn't easy for me, but I know I can do it....with Jesus' help! So that's where I am "at" this week!!! If I can organize my time and my thoughts, I might even be able to post here on a regular basis!!! That's my goal anyway! What's yours??? Want to join me??? What can we lose?....better yet - what will we gain????!!!!! I have been married to my Hi-School sweetheart since 1962! 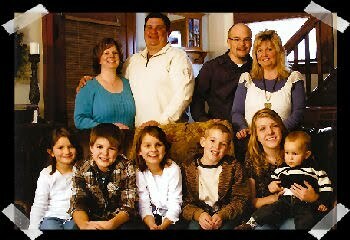 We have 2 grown, married kids and 6 wonderful grandchildren! I have been a Christian since 1970 and love Jesus with all my heart! My fav scripture is Eph. 3:20 because God has truly done exceedingly, abundantly above all I would ever ask or think, infinately beyond my highest prayers, desires, thoughts, hopes or dreams! It is my desire to bring glory to His Name with my life. Check these out for a blessing!! A great place to visit!!! Re-experience God’s Work This Weekend, and Walk In It!